At this webpage are the village flag and coat of arms of the famous village of Ried, Frjentsjerteradiel, Fryslân, the Netherlands. Of course it's most famous 'cause my granddad Pieter Feddema was born there. Info about flag and coat of arms from the site: The blue waving bar in the village's coat of arms is the symbol of the former Ried stream, which in the Middle Ages was a gully from the Waddenzee. This gully became silted up and, dammed in, shaped the the clay into very fertile agricultural soil. This is represented by the blue bar and the two corn ears. The cattle-breeding and mixed industry in the area are symbolized by the three green clovers. 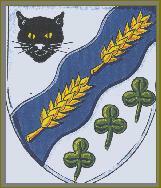 The cat face is the symbol of Ried's residents, who are nicknamed "Riedster katten", Riedster cats. The flag reflects the coat of arms - the yellow section represents the waving corn fields, the blue the Riedstream, and the white the clouds and the sky.